Redmond, WA, May 30, 2017 - ​Nester Jerez, the organizational representative of Distance Teaching and Mobile Learning in Southern American Region, is delighted to announce that the philanthropic and non-profit organization has donated computer equipment to High School Liceo Libertador, Merida Venezuela; to supplement and replace broken equipment in the existing school computer class. This humanitarian gesture is in line with the organizations commitment towards disrupting poverty circles and interjecting stable, educational mentors and programs in the lives of children worldwide. Distance Teaching and Mobile Learning is established with the primary aim of providing opportunities for kids around the globe to engage in free educational activities with qualified mentors online in order to build a foundation for their future lives. In the bid to achieve its vision of leveraging technology to provide access to free educational support to all kids around the globe, the promoters of the organization gathered like-minded humanitarians coupled with the acquisition of cutting edge educational technology. With a perfect blend of experienced humanitarians, tutors and advanced technology, the non-profit organization has successfully created online engagements and platforms where pre-screened and trustworthy volunteer educators can connect with children to establish a learning relationship that will guide the children to adulthood. The tutors and mentors at Distance Teaching and Mobile Learning platform have earned a standing reputation in delivering fascinating and life-changing educational programs that help to share knowledge, disseminate skills, and ignite curiosity in kids all around the globe. This contribution means an immediate solution to unsustainable lack in the institution and students now can better leverage information technology to improve their skills and knowledge. “We are committed to providing the means and capabilities for students to use this technology for free any time they need, while maintaining and growing qualified and engaged group of mentors and tutors” stated Nestor Jerez, the organization’s representative in Southern American Region. “Access to basic education from a young age is critical for the success of any country and only investment in the childrens' future can make a true, long-lasting difference." 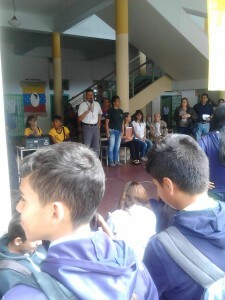 Jose Caraballo, the Principal of High School Liceo Libertador, Merida, Venezuela says; “the humanitarian donation of Distance Teaching and Mobile Learning has covered one old deficiency affecting the students in this institution. This contribution means an immediate solution to unsustainable lack in the institution and students now can better leverage information technology to improve their skills and knowledge. We have no words enough to signify our appreciation to the organization for this noble action”. Read more information on the students that have benefited from the humanitarian educational programs.